Why is ZOS 360 the Ideal Option for Managed Print Services at Schools & Education Offices? Schools and education facilities have one ultimate goal: to educate the students that they serve. Providing students with a top quality education can be very resource-intensive. Every dollar spent must be spent wisely. This brings us to the heart of why ZOS 360 is the best managed print services (MPS) solution for schools and education offices. 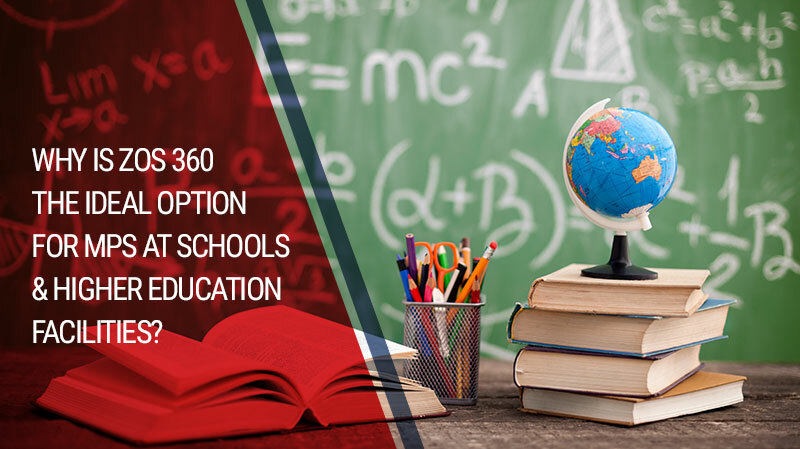 Unlike a cookie cutter solution that is implemented without thought or care, ZOS 360 takes a complete look at the needs and pain points for each individual education institution in order to provide a truly customized solution. ZOS 360 managed services looks beyond printers and technology. Whether you need managed print services for K-12 or managed print services for colleges, ZOS 360 can provide the right solution. Every organization – from elementary schools to colleges to fortune 500 companies – wants to achieve greater efficiency and productivity. ZOS 360 takes a complete look at your school or office to help identify areas where productivity may be slowed or hindered by inefficient workflows or poor document management. One of the first steps when implementing ZOS 360 is to inventory existing equipment. By doing this, redundant or under-utilized pieces of equipment can be identified. Obsolete equipment can be removed or upgraded as well. Most importantly, ZOS 360 will help identify areas where equipment may be holding you back. After identifying equipment issues, ZOS 360 looks at workflow processes to try and expose bottlenecks that could be a drain on productivity. Are unnecessary tasks required to get around issues presented by existing workflows? How can these workflows be improved with technology, software, or new strategies? Once these issues have been identified, there are a variety of cost-saving measures that can be implemented from substituting equipment to modifying existing processes. Next, a non-invasive tool is installed on user devices to identify which pieces of equipment and which processes are used most frequently. ZOS 360 uses hard data to help us truly understand the current needs and behaviors of users. Using this data, we are able to identify the statistical needs of users. In addition, accurate data gives us the opportunity to create a complete look at costs for using and maintaining your system. Once again, this provides even greater opportunity to identify potential efficiencies and solutions to problems that could be costing you valuable time and money. Creating a sustainable education environment isn’t just good for mother nature, it’s good for the bottom line. 50% of all waste in a working environment comes from paper waste. This is a potentially massive cost for schools and education offices that may already be operating on thin budgets. Simply by improving print management services, there could be an opportunity for massive reductions in wasteful printing. As mentioned, obsolete, under-utilized, and redundant equipment can be identified and removed or repurposed from existing networks. The energy these unnecessary pieces of equipment consume is largely wasted and, therefore, an unnecessary part of your budget. Energy efficient equipment can be installed, where appropriate, to further boost energy efficiency. Managed print services are only effective if the solutions actually fit in with the culture of your school or education facility. ZOS 360 takes into account your unique organizational culture and structure to help develop tailored solutions that actually fit. How does your team embrace new technology? What are the goals or objectives your organization has in place? These kinds of questions are taken into consideration during evaluation as well as during the creation and recommendation of managed print services. In order to further increase the success and efficiency of ZOS 360 managed print services, your IT processes and procurement methods will be examined. Essentially, your unique organizational behaviors from initial procurement to end user usage patterns are all evaluated to ensure the best results can be delivered. With managed print services for K-12 as well as managed print services for colleges, there is a serious responsibility to ensure that the best interests of students are always top of mind. The ZOS 360 process allows us to truly examine and evaluate your needs before making any managed print services recommendation. At Zeno Office Solutions, we strive to become a trusted partner of every organization we work with. That’s why there is no obligation when you request a ZOS 360 assessment. Let us prove the value offered by MPS provided by Zeno Office Solutions. Contact us to learn more about a ZOS 360 assessment and the benefits your school or office could see as a result.